Home Entertainment Captain Marvel: Who’s The Star? 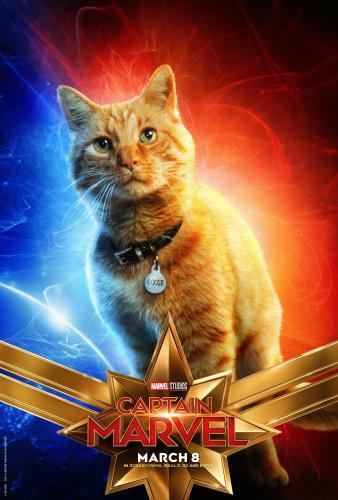 Captain Marvel opens in theaters on March 8th and we have to wonder is the real star a feline? No doubt that’s not the case, but after watching the second Marvel trailer, I wanted to see more of Goose. I have lots of questions about the plot and how this movie fits in the Marvel universe. Will this be a blockbuster hit because a female has the leading role or fall flat because its a new adventure without an existing fan base? You can’t spell h-e-r-o without “her”. Set in the 1990s, Marvel Studios’ CAPTAIN MARVEL is an all-new adventure from a previously unseen period in the history of the Marvel Cinematic Universe that follows the journey of Carol Danvers (Brie Larson) as she becomes one of the universe’s most powerful heroes. Tickets are currently on sale. Captain Marvel opens everywhere on March 8. Also, Marvel Studios’ “Avengers: Endgame,” arrives in theaters April 26, 2019!